Idle Muse Theatre presents the Chicago premiere of THE SCULLERY MAID. The war is over. The plague is regressing. 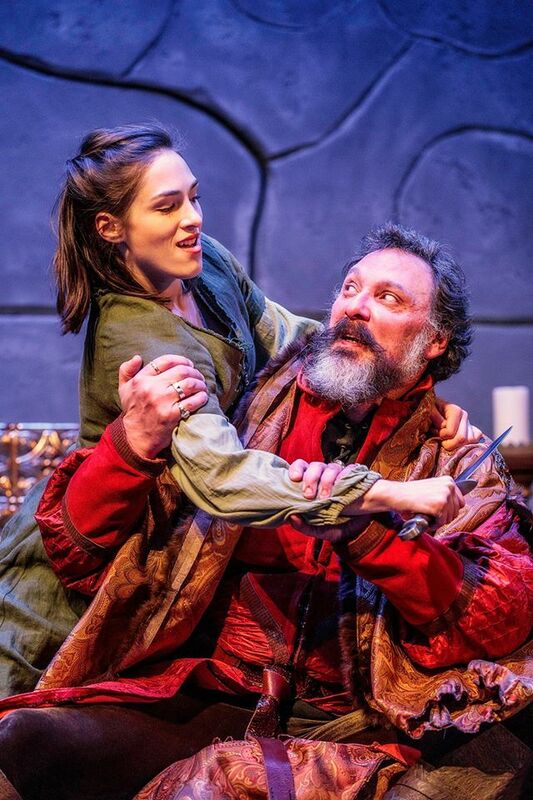 King Edward III (played by Dave Skvarla) has returned from the battlefield to face domestic disturbances in his castle. 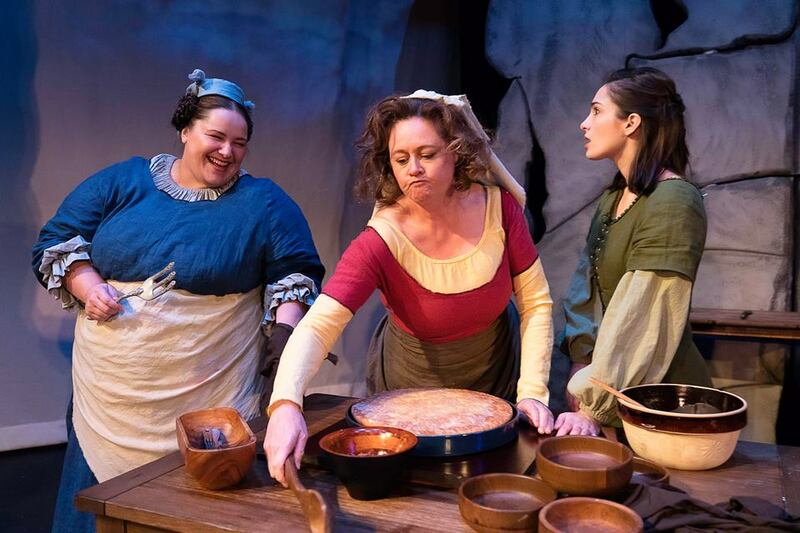 Playwright Joseph Zettlelmaier drops us into 1300s England where the kitchen staff is baking a cake for the royal homecoming. His play is a bit of an upstairs-downstairs-Masterpiece-Theatre-the-medieval-version. We see life from the staff’s perspective as the first act takes place in the kitchen. In the second act, the storytelling shifts to the King’s bedroom and we observe the stories from a different angle. Zettelmaier pens a tale about classism. He shows us how folks assimilate into or rebel against their station. In the first act, Anne Marie Lewis (Bess) trains the new gal Leslie Hull (Dulcie) in culinary duties. Where a resigned and over-worked Lewis focuses on baking, an animated Hull delights in the safety of her new surroundings. She describes the harsh realities of a plague-infested city with gusto. She is glad to clean pots or serve the King in exchange for being off the street. Hull’s upbeat spirit annoys the sullen Lydia Hiller (Miriam). Hiller doesn’t like Hull or her admiration of the King. Although Director Evan Jackson creates a kitchen of characters, Zettelmaier’s first act lacks real sustenance. The storytelling is heavy on exposition to explain backstories and cake baking. The engagement gets lost in the narrative. In the second act, we get to more the meat of this medieval tale. Hiller is ‘the scullery maid.’ And the play is her story. That becomes more apparent and dramatic in the second half. She and Skvarla face off in a clash of wills. A fierce Skvarla balances it nicely between barbaric and nobility. Hiller plays it like a pissed-off spitfire. Libby Beyreis’ violence design is almost too refined for the daggers being exchanged just through intense glaring. The two lock gazes in a terrific accusatory face-off. Skvarla’s commanding presence doesn’t stop the scrappy Hiller from attacking him. Their feud has some unexpected twists as they both wrestle with their identities and the accompanying realities. THE SCULLERY MAID struggles in the kitchen but finds the story in the bedroom. Run Time: The Scullery Maid is approximately 2 hours (including one 10-minute intermission).